He’s been called “Ireland’s answer to Jamie Oliver”. He has a successful music career as well as a very popular and award winning cookery blog. And now he’s about to launch his second cookery book, Kitchen Hero. 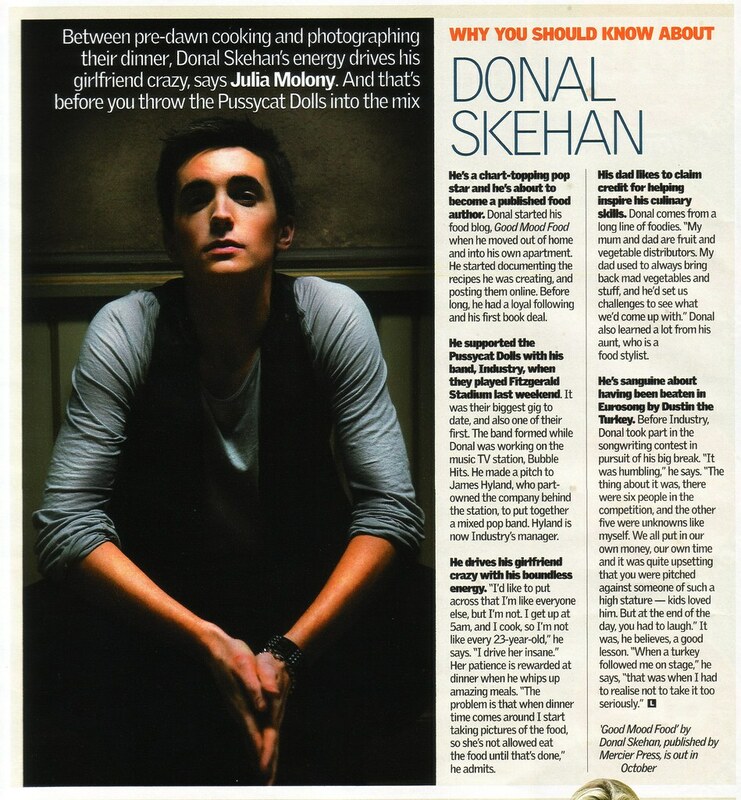 I am of course talking about the unbelievably modest overachiever and Ireland’s own, Donal Skehan. I’ve only recently read his first cook book despite having tried a number of the recipes. It’s a really informative read (the bits between the recipes like) there are lots of great tips, what to keep in the cupboards, thinking around the ingredients you have to hand in order to make the dish you want and much more. To me it’s a great introduction for beginners or those of us looking for fresh ideas and it reminds me a lot of Jamie Oliver’s “Naked Chef” books which are the ones that got me past the toast, fry ups and pre-prepared meal phase and into real cooking. Needless to say I can’t wait to see the new book and thumb through its pages, to drool over the various recipes for myself. What new delights will it hold? Unfortunately its not due for release until March 3rd, I guess I’m just going to have to pre-order it and wait. Best of luck with it Donal, oh and when are you getting your own TV show? Do you need an assistant for it? Yesterday morning the door bell rang so I headed for the front door to be greeted by a courier with a package for me. It was a bit large for a bag of flour, I thought and sure enough once the paperwork had been signed and the courier thanked, I hurried inside to open the package. Not only was there the flour as promised, but also a re-usable pasta box filled with dried penne and a recipe card. The recipes are for ravioli and a calzoni pizza. Now as some of my long-time readers know I’ve posted both pizza base and pasta recipes previously and I’ve posted about my difficulty in finding Farina Tipo 00 in Ireland so I’m overjoyed to hear that Roma are now bringing this product in to Ireland and that Superquinn and the larger Dunnes Stores will be stocking it. Thanks so much, the shopping trips to Italy were getting a bit pricey! I’m also really looking forward to playing around with my pizza base recipe and hope to get a little bit closer to that genuine Italian pizza flavour at home, in the next few days so keep an eye out for a new recipe in the coming weeks. A few Weeks back, I did a post about and highlighted some of my favourite pizza places in Dublin. Since then I’ve visited a few more and want to add to that post a little. In particular I want to mention two restaurants; one fantastic and the other a bit of a let down. I like to finish my posts on an upside whenever possible so I’ll start with the disappointment. Milano was the most recent addition to my summer long search for good Italian style pizza in Ireland. I should point out 2 things before I go too far into this, the first is that it was the restaurant in Temple Bar that we visited and secondly we were there as a result of a special offer they had advertised, which allowed us a Pizza for €0.15 with every main course ordered. The initial impression was quite good as the restaurant was busy when we arrived and even though we had not booked in advance I was pleasantly surprised that we were seated immediately. We were given menus and allowed plenty of time to make our choices but not so much as to make us feel neglected. Our orders were taken, two starters, two main courses (both pizzas) and two drinks, a Peroni for myself and wine for Elly. It was when the drinks arrived things started to go wrong. Our waiter poured my beer at the table which would have been nice except for it was a terrible pour and if that wasn’t bad enough the beer had only been in a cooler for a few minutes before serving, judging by the temperature, but it was drinkable and I wouldn’t even be mentioning it if the rest of the service had been good. The starters weren’t exactly earth shattering and to be honest given the descriptions on the menu I was expecting more. Then there was the extended wait between courses. During which I spotted the carton of bechamel sauce in the kitchen area of the restaurant. Now call me a food snob, but if I’m in a restaurant I don’t expect to be eating processed food! When our pizzas did arrive my regular pizza was small and unusually thick based for an Italian pizza, Elly’s thin base option was rolled so thin that it couldn’t support the moisture of the sauce and was a bit soggy and limp while somehow managing to be difficult to cut and chewy. We were availing of a rather good special offer which meant that at least we didn’t over pay, but having now sampled Milano’s fair I can say with confidence that there are at least three other restaurants (Bar Italia, Botticelli and Le Med) within 100 yards that will serve you better pizza and for less than the regularly priced menu in Milano. So that’s enough about them, the other restaurant that we visited recently was Pregos in the Ballyowen Shopping centre, Lucan‎. As they don’t seem to have a website they can be contacted on 01 610 9119 (Location Map)‎. I’ve heard a lot about Pregos and have been eager to try it out as it’s close to home and has a good reputation locally. From the outside you could be forgiven for thinking that Pregos was a pizza take-away/delivery place on closer inspection you see that there is a restaurant upstairs, so in we went and up the stairs to one side of the counter where we were greeted by an Italian waiter and cosy little restaurant space with seating for about 40 people. After a very brief wait while a table was cleared for us we were seated. We were not made to feel rushed at any time and the only hitch we encountered was with the bottle of wine we initially ordered as it was out of stock but a very pleasant alternative was suggested (with a little bit of local knowledge from our waiter sealing the deal) and greatly enjoyed. The service was quick and attentive without making us feel rushed at all. Both our starters and main course were fantastic. The pasta was great and the presentation simple but effective. While we were enjoying our meal I spotted some Pizzas being delivered to other tables and was a little disappointed that I had decided to be a grown up and order pasta instead, not that there was anything wrong with the pasta just that the pizzas looked that good. As we left the restaurant that evening there was a queue of people on the stairs waiting to be seated and as we walked home I realised that at no point had any seat in the restaurant been empty for more than a few minutes in the time we were there, and I fully understand why, the food is simply superb. The following evening neither myself or Elly felt like cooking so we telephoned a take-away order in and drove round to collect our pizzas. They really didn’t disappoint, the bases were thin, crisp and a little bubbly with really fresh toppings and cooked quickly in a pizza oven. The only negative I can give is that the Pizza oven was not wood fired which really does add the final touch to the flavour but even without this Pregos’ pizzas are exceptional. If you happen to find yourself in Lucan then do treat yourself, you really won’t regret it. Once we found out how simple this is to make, a pasta machine was ordered and while we still keep some dried pasta on the shelf, most of the time we make our own fresh pasta. When possible, it’s best to use Italian tipo 00 Flour, which is very easy to source in Italy (about €1 per kilo) but I’ve yet to find a reliable source in Ireland. Superquinn has come closest, having Tipo 0 in stock from time to time but not always (When they do I tend to buy all the stock). You can use plain flour (the finer, the better) for this recipe and it will work perfectly, but if you happen to spot somewhere that sells Tipo 00 in Ireland please let us know as it does make the pasta taste much better. We’ve been rather lucky in that whenever we hear of anyone going to Italy, we’ll ask them to bring some back for us and on our last trip we brought back a few kilo’s and were very close to having to pay excess baggage charges. So is anyone going to Italy any time soon and would you like to do us a big favour?